AMHR multiple National Top Ten performance and Multicolor winner. 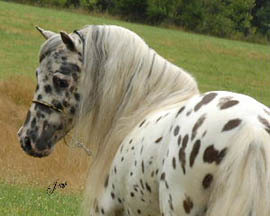 Splash has produced more AMHR National Champions and Reserve National Champions in Halter, Multicolor and Performance for us than any of our other stallions. He produces an average of 90% appaloosas. 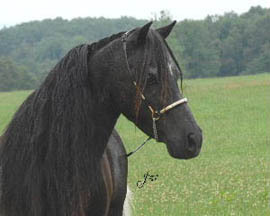 His foals also inherit his unique "single-foot" gait at the walk, which is a large horse "gaited" type walk. 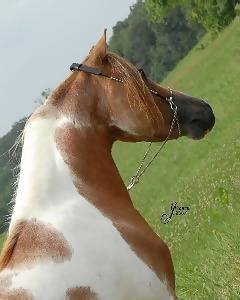 This actually makes them four gaited horses, walk, single-foot (running walk), trot and canter. 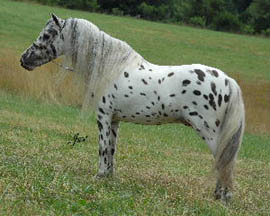 This unique trait shows how strong the true appaloosa bloodlines are in this line of horses. It also enables them to really engage their hindquarters in harness and performance. 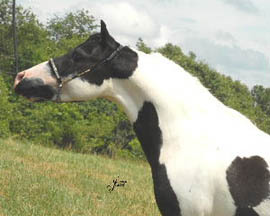 AMHR multiple National Top Five Halter winner and has never placed below fifth in ANY class (Model, Halter, Amateur Halter and Liberty), at any National Championship Show that he has attended. 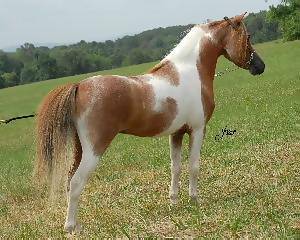 Magic has sired several AMHR National and Reserve National Halter Champions and an AMHA Top Ten Winner. He is also the sire of two of our top producing stallions and several of our exceptional broodmares. 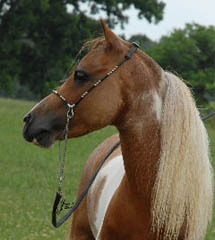 His foals are consistently elegant with exquisite heads, long, swan like necks and animated action. He also passes on his exceptional temperment and quirky personality. This gorgeous stallion entered our lives as a wobbly legged, premature foal who blossomed into Prince Charming! He was first shown as a weanling and after enduring an hour long first cut, only to make it into the final, wait another hour and then show again...to place FOURTH in the Nation!!! He continued his winning ways with at least one National Top Five placing each year, until his retirement for breeding at three years old. His foals are continuing his tradition of excellence. 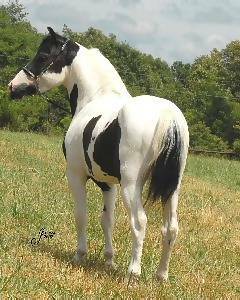 "Bandit" is a FULL brother to THREE AMHR National Halter Champions! 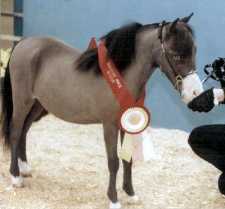 He is an AMHR National Top Five winner at halter. 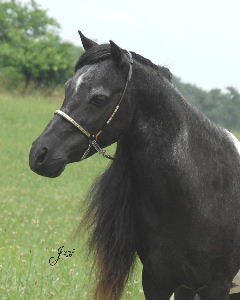 Bandit is the youngest Magic son we are currently breeding. He has proved an amazing cross with many of our mares, including several Magic daughters. 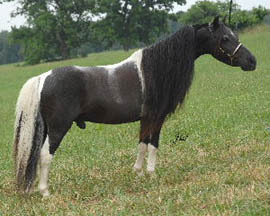 A consistent producer of correct, quality foals. 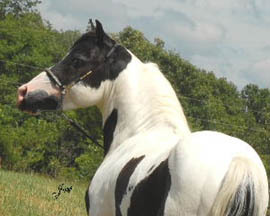 Skippy is the sire of several exceptional show horses with tobiano, tovero, overo and appaloosa coloration.